In a recent webcast titled “The Rise of India’s Digital Consumer”, the director of ComScore, Kedar Gavane provided interesting insights into the growth of internet usage in India over the twelve months ending in July 2012. The Virginia-based Internet analytics firm focuses on supplying market intelligence data to clients that include the world’s biggest corporate giants. Data is obtained through complex software systems that focuses on population samples, after which appropriate adjustments are made to estimate the views of larger masses. In spite of being widely trusted, comScore’s data collection exercises haven’t been free from controversy and data from competing firms has conflicted with that of comScore in the past. In the webinar, the data presented was based on usage patterns that were studied on people aged 15 and above in the home and work environments. ComScore highlights that the worldwide online audience has jumped 7%, with Asia-Pacific markets adding more than 40 million users. India has been identified as the fastest growing online market during the same period, with a 41% rise. This is much higher than China (5%), Brazil(6%) and Russia (20%). With most online categories in Indian exhibiting an average reach below the global figures, the potential seems to be high. India’s internet penetration has been estimated at 10%, with 124.7 million users going online during July 2012. ComScore has found 75% of the internet audience in India to be aged 35 years and below, promising to make it the youngest online population in the coming years. In the webcast, Kedar emphasized that the audience is only going to get younger in the future. Females formed 39.3% of the total audience, and the sharpest growth was observed among male and female segments in the age-group 15 to 24.
comScore’s findings show the travel, search, social networking and news arenas to be growing sharply in India’s online world, crossing worldwide averages. There’s an apparent high potential for retail, games and health, since they fall below worldwide trends. Over the survey period, Google and Facebook topped the growth charts, at 59.7 and 52.1 million users respectively. An interesting point to note is that the data shows a rise of over 10 to 40% in the frequency of user visits for the top ten sites. The news category appears to be one of the most engaged, with up to 5 minutes spent on it by each unique visitor. A growth of 54% has been noted in this category, with multiple means of accessing the news, including mobile devices. This is lesser than the global average of 80% but is catching up. Yahoo-ABC News Network leads from the front with a July 2012 reach of 20.4%, followed closely by The Times Of India at 18.7%. Other key players include New York Times Digital (11.3), HT Media Limited (11.1%), oneindia (9.6%), India Today Group (8.5%), IBN Live (7.9%) and NDTV (7%). Another interesting set of data revolves around the non-resident Indian (NRI) unique visitors to some of the leading Indian websites. comScore also concludes that the regional newspapers have the highest share of non-resident audiences and are the best way to connect with them. As many as 3 in 5 internet users in India visit retail sites, which have registered a growth of 43% over the last year. The statistics indicate a close contest between Snapdeal and Flipkart in horizontal retail, and Jabong and Myntra in the lifestyle category, all of them fueled by aggressive marketing and growing demand. July saw a total of 37.5 million unique visitors from India coming to retail sites, with the apparel sub-category being the fastest growing sub-category at a year-on-year growth of 362%. Consumer goods, sports equipment and home furnishing have shown promising signs of growth as well. Vertical retail segments are expected to grow the fastest in the coming months. With a rise in people using private buses, redbus.in shows a reach of 2% during July. Direct debit or Netbanking is the most popular payment method as per figures from the second quarter of 2012, with a 58% share. Visa and MasterCard follow at 21% and 12% respectively. IRCTC averages at $17 (INR 935) per transaction, while Flipkart indicates $35 (INR 1925) per transaction. In the social networking space, Facebook has risen 47% in terms of unique visitors between the twelve-month survey period. Around 52 million users are indicated to have signed up. LinkedIn’s unique visitor count has risen 36%, a reflection of the decent show put up by the job market. Orkut, which once used to be widely popular, has had its unique visitor count plunge by 69% – an indication of little attention from its parent company Google. Twitter use in India continues to be low, and the number of unique visits has risen just 5% to 3.8 million in July 2012. The unique visitor count for entertainment sites is indicated to have touched nearly 56 million in July 2012, up from nearly 41 million a year before. YouTube is a runaway leader in this category, with a reach of 53.7% at the end of July 2012. They are followed by CBS Interactive (14.8%) and Songs.pk (8.8%). In spite of a fairly high reach of 89% in India, the entertainment category is still behind the worldwide figure of 94.1%. Business and finance has grown at 35%, with SBI being the most popular bank. ICICI Bank follows at the second position, and HDFC at the third. 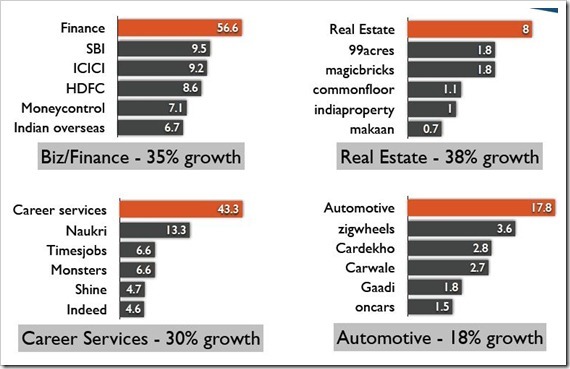 Real estate has grown 38%, career services have grown 30% and the automotive category has shown a growth of 18%. This category has shown a growth of over 37.3% and the engagement figure is indicated to be 3.4 billion videos each month. 52% of all the videos belong to the entertainment category, and the soaring viewership in the video category has resulted in a corresponding boom in video advertising. Over the last year, the number of pages viewed on mobile devices has grown from 3% in July 2011 to 7% in July 2012. Information covering food and travel, and online trading are the most popular subjects among tablet users. As for the operating systems used in tablets, iOS controls 80% of that market share. The statistics presented by comScore suggest that smartphones and tablets are going to drive usage further through WiFi access. A huge growth is expected in the games, health, news and retail categories, with Kedar pointing out that social media is a central touch point for all categories. Going by predictions based on past trends, entertainment will dominate the content growth across both mobile devices and PC’s, and categories like travel, news and career services are expected to continue showing decent growth. There’s a projected increase in cash-on-delivery payments, particularly in the retail category. With India’s internet population expected to get even younger in the coming years, there’s likely to be a boost in online advertising targeting the youth. India Internet story is shining so far & expected to continue further. I feel online video & mobile sector still has a great potential in Indian Internet industry as reach of the broadband connection & 3G in Tire II & Tire III cities in India is increasing. Internet is the best source of knowledge let it be in terms of news or learning and that’s why it is being used much. Thanks for sharing these statistics. Internet is the way forward for the young in India. They will shape the way traditional media and business gives way to social media and e-biz. An extremely relevant study, given the times we live in.